Over time, the American workforce has become more educated and the college-going population has diversified. Today’s students tend to be older and often have young children. About 1 million low-income parents who attend school or training also work. Further, many combine full-time work with full-time school attendance. This brief summarizes this population’s characteristics, how they address these competing demands, and the supports they receive while doing so. The brief suggests how existing federal policy initiatives such as the new Workforce Innovation and Opportunity Act and the Child Care Development Fund can better support working parents in their educational pursuits. Recent years have brought focus on the low completion rates of students attending community colleges and four-year schools, and the need to make institutions more accessible to nontraditional students. This an opportune time to better understand the working student-parent population and supports that might help increase their educational attainment. Further, passage of the Workforce Innovation and Opportunity Act (WIOA) and reauthorization of the Child Care Development Fund (CCDF) may provide additional opportunities to support these students. 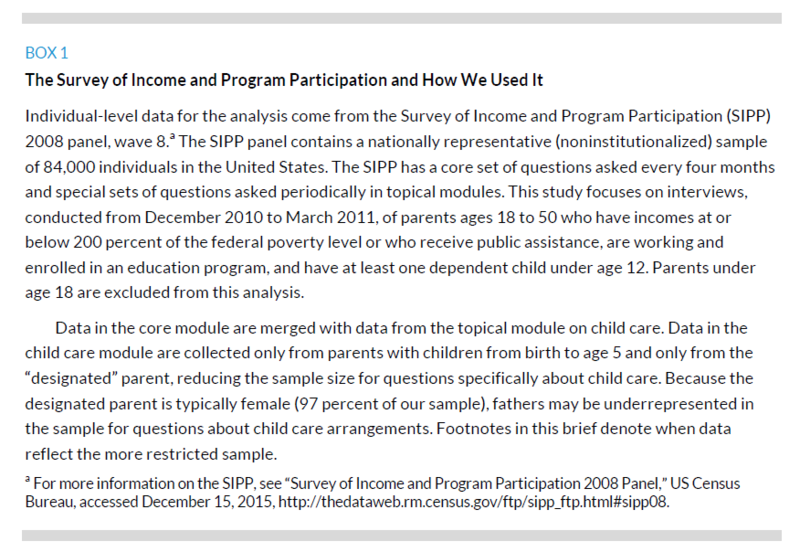 Eyster, Callan, and Adams (2014) find in their examination of the Survey of Income and Program Participation (SIPP) that about half of low-income parents engaged in education and training combine it with work. Nationwide, approximately 1 million low-income working parents attend school. This brief aims to gain a better understanding of the working student-parent population and the supports and interventions that may facilitate educational success. As the labor market has shifted, Americans’ education levels have increased. In the 1940s, only about 5 percent of the US population had completed at least four years of college; today, 32 percent have completed a bachelor’s degree (NCES 2015; US Census Bureau 2000).1 During this same period, the college-going population has become increasingly diverse. Today’s students come from disparate economic and racial backgrounds, tend to be older, and often have young children (CLASP 2011). These trends are projected to continue in the future (NCES 2013). One likely reason more students go to college is the perceived value of a postsecondary degree in the labor market. In 2014, bachelor’s degree holders earned a median $1,101 weekly, compared with $792 for associate’s degree holders and $668 for those with a high school diploma or its equivalent. The higher the degree individuals earn, the less likely they are to be unemployed. In 2014, the unemployment rate for those with bachelor’s degrees was 3.5 percent, compared with 4.5 percent for associate’s degree holders and 6.0 percent for those with high school credentials. People holding a professional degree earned the most and were the least likely to be unemployed, with average weekly earnings of $1,639 and an unemployment rate of 1.9 percent (BLS 2015). Despite the increasing number of students attending college and the value of postsecondary education, many students struggle to complete their educational programs. According to data from 2014, only about 19 percent of students who had enrolled in two-year public colleges (in degree or certificate programs) graduated within 150 percent of the time expected; graduation rates from bachelor’s degree programs were higher, with 58 percent of students enrolled in public institutions graduating within six years (NCES 2015). One potential explanation is that these diverse students need more supports than postsecondary institutions are able or willing to provide. Multiple public and private efforts have aimed to improve success rates by making these institutions more responsive to the needs of their student bodies. One nontraditional population that could benefit from these improvements is low-income parents who work. While additional education or training would likely improve these students’ long-term prospects for self-sufficiency and upward mobility, several obstacles may prevent them from achieving their educational goals. Such students have complex needs that stem not only from the resources required to support a family while pursuing education and training, but also from the complex schedules that they must manage to do so (Adams, Spaulding, and Heller 2015). Many state CCDF policies limit families’ ability to participate in education and training programs to receive child care supports (Adams et al. 2014), but CCDF reauthorization creates opportunities to rethink these policies (Adams and Heller 2015). Similarly, Spaulding (2015) notes that the WIOA specifically names single parents as one group with barriers to employment that states and localities should try to serve better. What are the characteristics of these families? In what ways are these families combining education, training, and work? What supports are these families receiving to work and go to school? What do these data suggest about new efforts to support these families through WIOA and the CCDF? At the time of the survey in 2010–11, 968,106 low-income working parents were in education programs nationwide. These parents represented about 43.6 percent of all low-income parents enrolled in school. Of the nearly 1 million parents in our sample, most were female (71 percent) and half were white (52 percent), with smaller numbers of African American and Hispanic students (24.9 percent and 18.1 percent respectively); racial and ethnic differences varied little by age. Reflecting the shift to a nontraditional-age student body, more than half of respondents were 25 to 35 and a quarter were 36 or older, with only 18.6 percent being traditional-age college students (18 to 24). Slightly more than half the parents were single (56.6 percent). About two-thirds of respondents, however, indicated that their household included teens or adults (ages 16 or older) who were not their spouses. A larger proportion of female students was among the traditional-age population than among the nontraditional-age population: 84.6 percent in the 18 to 24 age group compared with 67.8 percent in the older age group. Not surprisingly, students ages 25 and older were more likely to be married, with 47.2 percent reporting that they were married compared with 26.7 percent of traditional-age students. Students in the sample had completed varying levels of education. The majority (59.6 percent) reported that they had completed some college, which is not surprising given that students were enrolled in education programs and were likely reporting on the coursework completed in their current programs. A small percentage of students (6.8 percent) had less than a high school diploma, and 20.7 percent said they had only a high school diploma. Nearly 13 percent said that they already had a college degree, which means they were likely pursuing additional advancement opportunities. There was a nearly even split between student parents with one child and those with more than one child (52.1 percent versus 47.9 percent, respectively). Almost a third had two children and about one-fifth (17.5 percent) had three or more children. A large portion had very young children, with 41.9 percent indicating that their youngest child was 2 years old or younger. A little less than a third of respondents (27.8 percent) said that their youngest child was 3 to 5 years old, and nearly the same percentage (30.3 percent) said that their youngest child was 6 to 12 years old. As might be expected, older students were more likely to have more children. Approximately 45 percent of the nontraditional-age students said that they had only one child, compared with 85 percent of younger parents who reported having one child. At the same time, more than 85 percent of parents ages 18 to 24 reported that their youngest child was 2 years old or younger compared with nearly 32 percent for parents ages 25 or older. Most low-income student parents (91.6 percent) worked one job, with 8.4 percent working two jobs. While the majority reported working a regular daytime schedule (61.4 percent) and a small portion worked an evening or night schedule (8.1 percent), about 30 percent said that they had irregular hours, a rotating shift, a split shift, or another scheduling arrangement (figure 2). 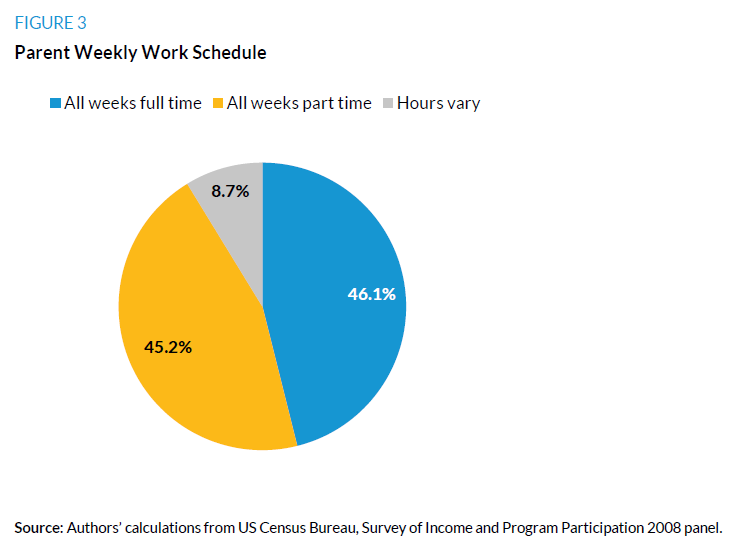 About 46.1 percent of low-income students in the sample reported working full time, with nearly the same number (45.2 percent) working part time and an additional 8.7 percent working variable schedules (sometimes full time and sometimes part time) (figure 3). About half of whites and Hispanics worked full time (49.5 percent and 55.6 percent respectively), compared with about a third (36.9 percent) of African Americans. 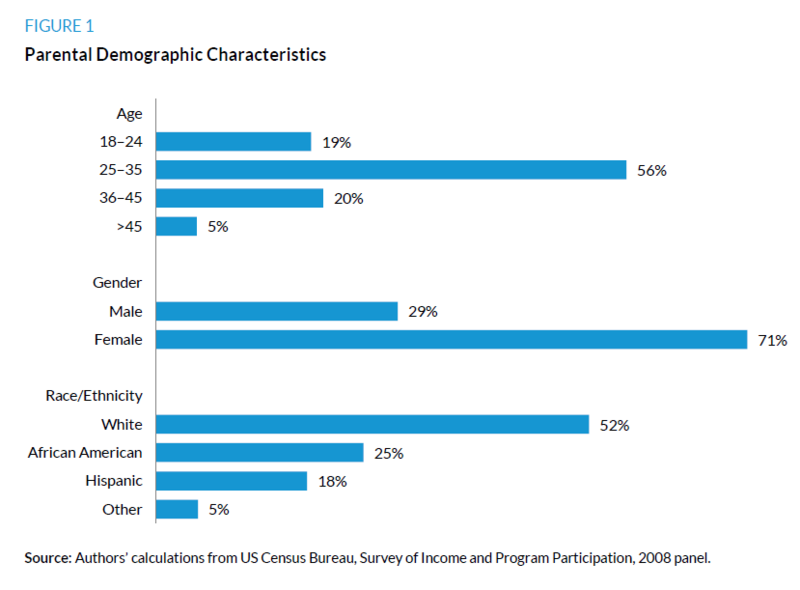 The lower percentage of African Americans working full time may reflect the challenges African Americans face in the labor market (Spaulding et al 2015). Those parents with children 2 and younger were the most likely to work full time; about 45 percent worked full time compared with about 29 percent of parents with 3- to 5-year-olds and 27 percent of parents with 6- to 12-year-olds. 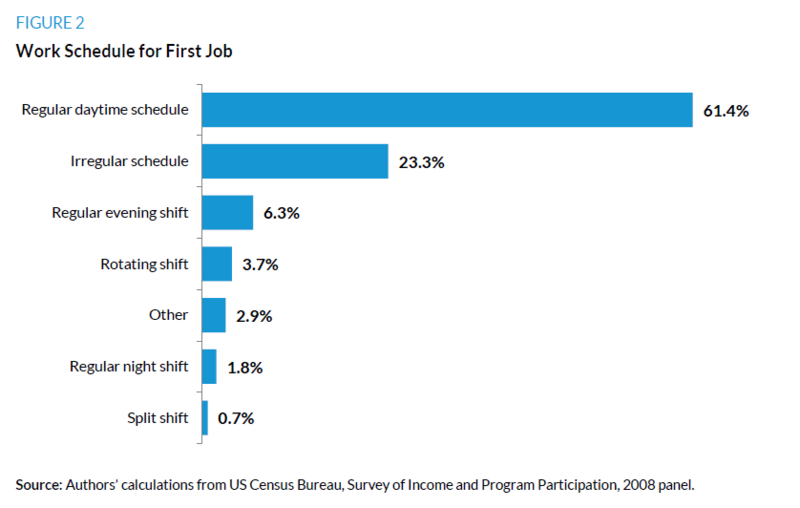 About two-thirds of respondents reported that the schedule for their first job was required, meaning they could not choose their schedule. A smaller percentage (10.9 percent) said that better child care arrangements were the reason for their schedule, and 3.6 percent said it allowed for care of other family members. Nearly 10 percent said the reason was to allow time for school (figure 4). For those holding more than one job, the proportions for the reasoning behind the schedule for the second job were similar. Respondents reported being enrolled in a range of educational activities and programs. The majority (61.3 percent) reported enrollment in a college degree program, with 13.5 percent saying they were in a college nondegree program.2 About 10.3 percent reported enrollment in graduate school and 9.0 percent in a vocational school.3 Less than 6.0 percent said they were enrolled in a program designed to help them complete education at levels of high school or lower. 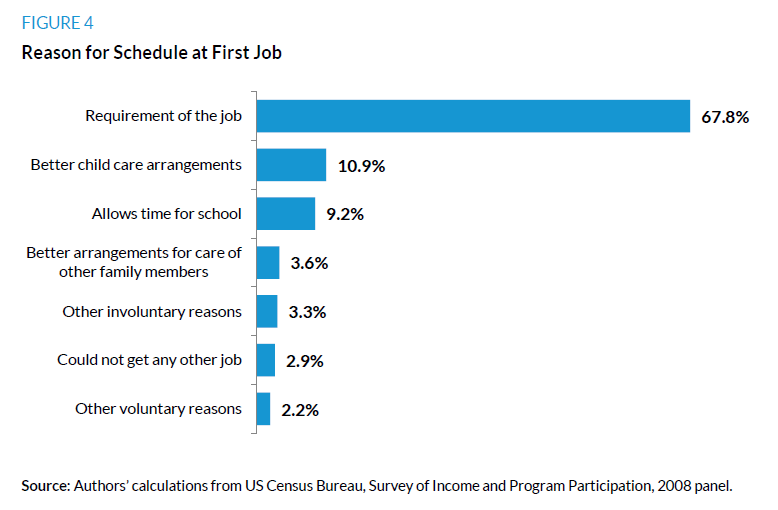 While one might assume that low-income working parents would be attending school part time, the majority of respondents (57.1 percent) reported attending school full time. Of those respondents who reported full-time work, nearly half (46.7 percent) were also enrolled in school full time. Younger students were more likely to be enrolled in school full time; 73.2 percent of students ages 18 to 24 said they were in school full time compared with only 53.4 percent of older students. Not surprisingly, these younger students were more likely to be enrolled in high school programs (9.6 percent for younger students compared with 3.5 percent for older students). 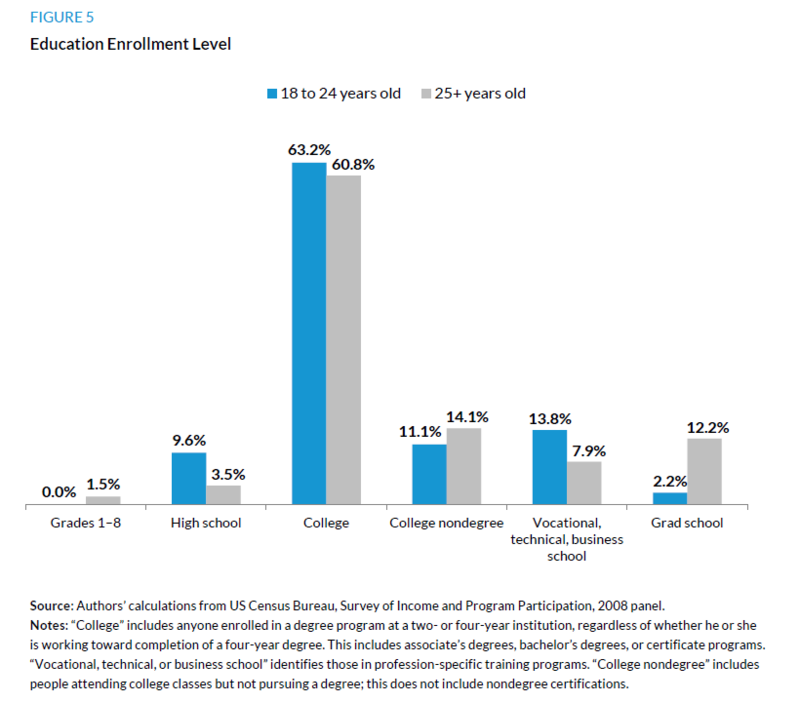 Enrollments in college programs similarly differed by age (63.2 percent compared with 60.8 percent), as shown in figure 5. Family members, educational financial assistance, and social service benefits provide some low-income working student parents with supports to offset expenses and care for their children. We cannot tell how sufficient these supports are for the families receiving them, only whether they receive them or not. About half of low-income student parents with children ages 5 or younger relied exclusively on family members to care for their children while they were working or in school.4 About a quarter of parents used center-based care only and another 20 percent used a combination of child care types; only 4.7 percent and 2.2 percent relied exclusively on informal, nonfamily care or family day care providers, respectively. These percentages were generally the same whether parents were working full or part time. Only when full- or part-time hours varied do we see differences in the types of care used; those who had varied hours relied less on center-based care exclusively (10.8 percent, compared with 23.3 percent for those with full-time hours and 27.7 percent for those with part-time hours). At the same time, those with variable hours were more likely to use a combination of care types: 37.5 percent compared with 18.3 percent for full-time workers and 21.0 percent for part-time workers (figure 6). More than two-thirds of student parents reported receiving some form of education assistance (figure 7), but about 30 percent said that they did not receive any educational assistance (note that some students may be in school programs that are free to students). Students enrolled in college nondegree programs were least likely to receive educational assistance, with 40.4 percent receiving educational assistance compared with much higher rates for students enrolled in college (84.5 percent), graduate school (73.8 percent), and vocational school (67.2 percent). Nearly half (48.1 percent) of students overall said that they received Pell grant aid (the primary source of federal grant money for low-income students), compared with 27 percent of students in college nondegree programs and 40.6 percent of students in vocational school programs. Very few students in the overall sample reported receiving another type of federal grant (3.1 percent) or participating in a work-study program (2.7 percent). A higher percentage reported receiving a loan that has to be repaid, such as a Stafford or Perkins loan (28.1 percent). Some (8.1 percent) said they received a grant, a scholarship, or tuition assistance from their school, and about the same amount (7.4 percent) said they received a grant or scholarship from the state. About 4.3 percent said they had received employer-provided educational assistance (figure 7). In addition to receiving educational financial aid, many reported receiving other types of financial support from social service agencies. Approximately 47 percent of respondents in our sample said that they were receiving social service benefits, with almost half (46 percent) saying that they received Supplemental Nutrition Assistance Program (SNAP, also known as food stamps) benefits. A very small number (3.9 percent) said they received Temporary Assistance for Needy Families (TANF) benefits. Students in vocational schools were more likely to report receipt of TANF than students in other types of programs or in the general population, at 11.4 percent. This is likely a reflection of the ”work-first” orientation of TANF policies, which tend to support participation in shorter-term vocational programs and prioritize immediate employment over training. Similarly, vocational students were also more likely to receive any benefits (TANF, Social Security Income [SSI], SNAP, etc. ); over three-fifths (60.8 percent) said they received benefits, compared with less than half of students in high school, college, and graduate school programs. Students in college nondegree programs were least likely to report any kind of social services assistance, at 38.4 percent. A small percentage of students (14.9 percent) reported that they received child care assistance. About 41.3 percent of parents receiving child care assistance had children 2 or younger, and nearly the same proportion (37.9 percent) had children 3 to 5 years old. About a fifth (20.8 percent) had children 6 to 12 years old. Nearly 90 percent of those receiving child care assistance were single parents. Interestingly, students in the younger age group were more likely to receive TANF benefits, with 14.4 percent of students ages 18 to 24 reporting receipt of this assistance versus 1.4 percent of students ages 25 and older. The same was true with receipt of any social services benefits (TANF, SNAP, SSI, etc. ); more younger students (58.6 percent) than older students (44.1 percent) received one or more of these government benefits. This may be because younger student parents are more likely to be single, and single parents are more likely to receive such benefits. Figure 8 shows that while some parents (about 18 percent) received no support, 82 percent of parents received some type of support. 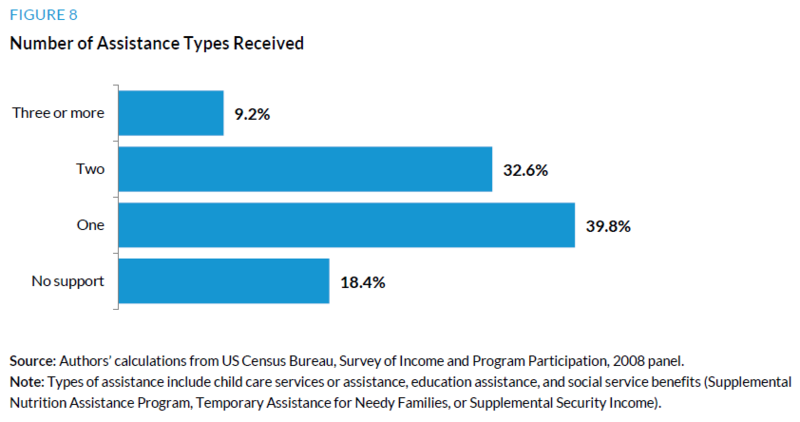 The largest group (40 percent) received one type of assistance, a third (33 percent) received two types of assistance, and less than 10 percent received three or more types of assistance. 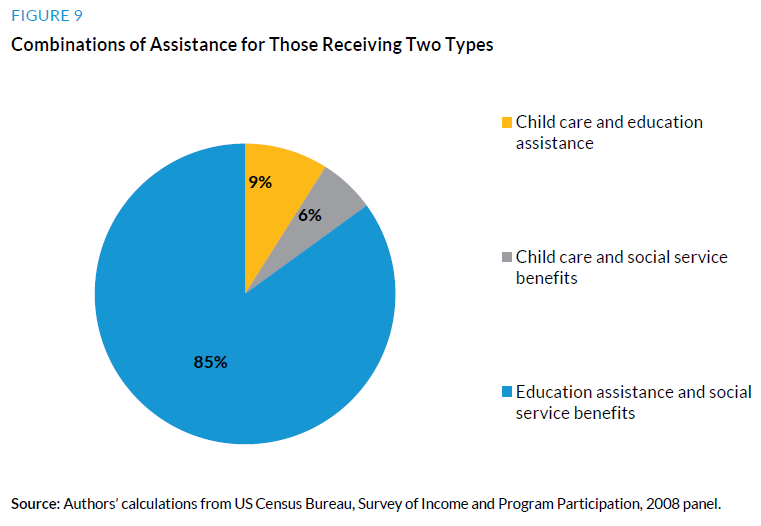 As shown in figure 9, of those in the sample who received two types of assistance, parents were most likely to receive combinations of social service benefits and educational assistance, but least likely to receive combinations of social service benefits and child care. Nearly 1 million low-income parents were working while they attended school, with about half working full time. Of those who worked full time, nearly half also attended school full time. About half were between the ages of 25 and 35. About half had one child and about a third had two children, with about 42 percent indicating their youngest child was 2 or younger. More than one-third reported that their primary employment occurred during some type of nontraditional hours, such as the night shift, a rotating shift, a split shift, irregular hours, or some other nontraditional schedule; about 8 percent of parents reported having more than one job. 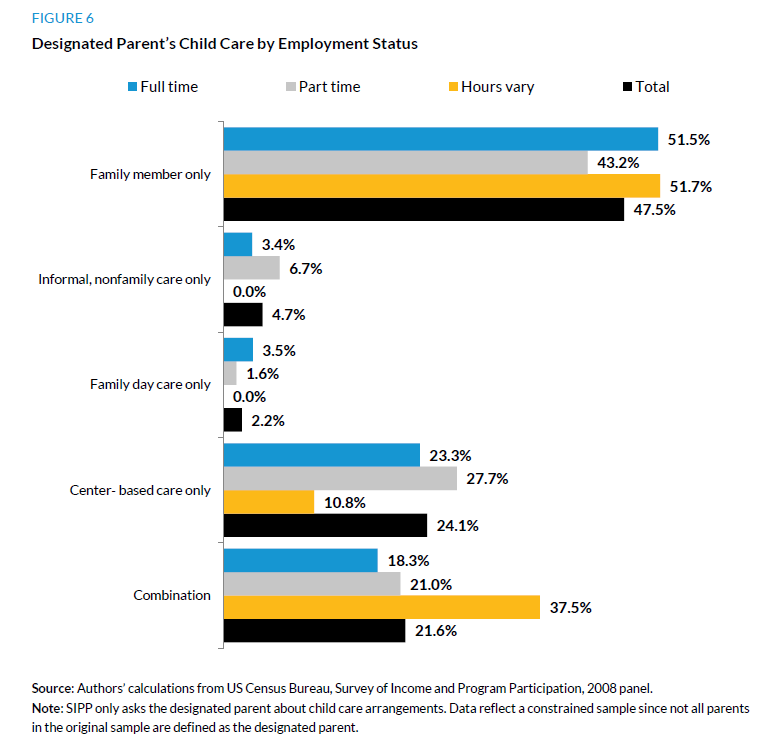 Parents with young children were the most likely to work full time. About half with children younger than age 5 relied exclusively on family members to care for their children. 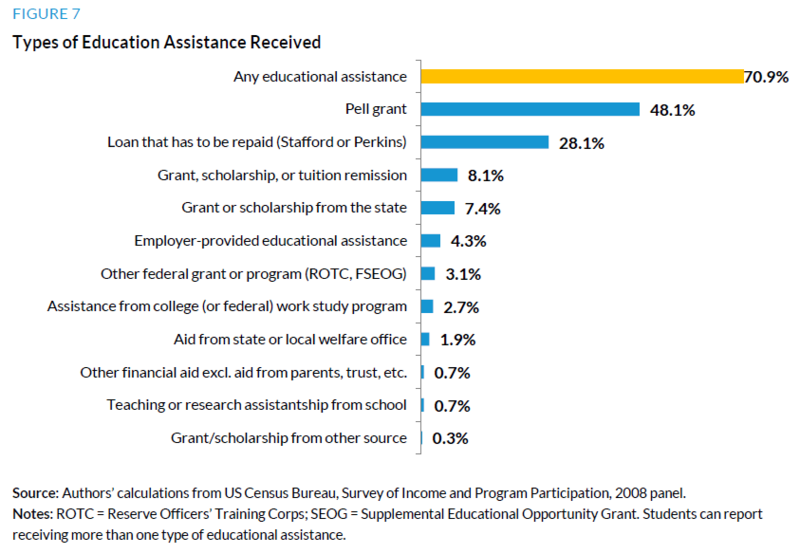 Slightly more than two-thirds received educational financial assistance such as Pell grants, student loans, or other educational aid. Half received other social service benefits, such as SNAP, TANF, or SSI. Only 15 percent reported receiving child care subsidies. Almost one in five received neither educational assistance nor social service benefits. About 1 million low-income parents with children younger than 12 are combining education and work. While these parents represent a sizeable portion (43.6 percent) of all low-income parents in educational programs, they make up only about 4 percent of the population of low-income parents (22 million low-income parents overall). The broader population of low-income parents is generally less educated than those enrolled in education; about 56 percent hold a high school diploma or less, compared with nearly 28 percent of those in our sample. Given their lower levels of education, many could benefit from supports and innovative programs to help them access education. Here we discuss some of the key challenges low-income working student parents face and the implications for policy and practice. Challenge #1: Student parents must manage complex schedules. Many student parents report combining full-time work and full-time school, working irregular schedules, and managing child care for multiple children. These dynamics often create the need for child care during nontraditional hours. A forthcoming analysis of the National Survey of Early Care and Education (NSECE) data indicate that only 9 percent of child care centers are open during any “nonstandard” hours, including evenings after 7:00 p.m., overnight, or during weekends (Greenberg, Derrick-Mills, and Healy, forthcoming). These complex schedules may also make it difficult for parents to persist in school. With nearly round-the-clock demands on their time, low-income parents may find it difficult to complete required school work or make time for emergencies. Such circumstances can contribute to stress and, in turn, affect their ability to stay in school (Johnson et al. 2009). Challenge #2: Student parents often have young children. Parents with children 2 and younger are the most likely to work full time; about 45 percent work full time compared with about 29 percent for those with 3- to 5-year-olds and 27 percent for those with 6- to 12-year-olds. Child care for young children has been shown to be less available than care for older children (Chaudry et al. 2011), who can generally get care (at least during traditional hours) through the public school system. The younger the child, the harder it is to find care. Recent analyses of NSECE data indicate that while 60 percent of centers serve children from birth to age 2, 97 percent of centers serve children from 3 to 5 years old (Greenberg, Derrick-Mills, and Healy forthcoming). State and national efforts to expand prekindergarten programs increase the availability of high-quality care primarily for 4-year-olds, but not for infants and toddlers. Challenge #3: Student parents report limited receipt of child care subsidies. Only about 15 percent of students indicate receiving child care subsidy support. A review of state CCDF child care subsidy policies indicates that in 47 of 50 states and the District of Columbia, parents are eligible for child care subsidies to pursue postsecondary education and training (Adams et al. 2014), but 17 states limit support to particular types of degrees, 11 states limit support to activities that will lead to immediate employment, and 4 states link support to grade requirements. That same study indicated that only 8 percent of families receiving the CCDF child care subsidy nationwide were being supported for a mix of school and employment activities. Unfortunately for the many parents who could benefit from this assistance, ASPE (2012) has estimated that only about 28 percent of children eligible under state guidelines were served by the program in the year the estimates were performed. Challenge #4: Low-income student parents who work rely heavily on their families to care for their children. While this may indicate a preference to leave their children with family members, it may also be a result of the challenges depicted above. Student parents have no other recourse when care is not available during the times they need it, for their children’s ages, or at a price they can afford. If students have families they can rely on, this is perhaps not a problem, but what about the ones who do not—who either live far away from their families or have family members who are also working? Challenge #5: Low-income student parents with variable work hours are the most likely to use combinations of child care types. Thirty-seven percent use a combination of care types compared with 18.3 percent for full-time workers and 21.0 percent for part-time workers. A recent analysis of both high- and low-income working mothers (Enchautegui, Johnson, and Gelatt 2015) shows that regardless of income, mothers with nonstandard schedules are more likely to use combinations of child care arrangements. Regardless of ability to pay for child care, single child care options are likely insufficient for parents with varying and nonstandard hours. Challenge #6: A fifth of student parents report not receiving social service benefits. While some may be temporarily poor because they are students, it may be that some are not accessing critical benefits that could help them complete their education. Studies have shown that finances are a major reason students drop out of school (Johnson et al. 2009; Goldrick-Rab and Sorenson 2010). The 2014 reauthorization of the CCDF and the 2014 replacement of the Workforce Innovation Act with the WIOA create new opportunities for states and communities to individually and collaboratively support the needs of low-income student parents who are working. Next we suggest several strategies that state policymakers; state, regional, and local workforce boards and educational institutions; advocates; and service-delivery providers should consider when revising policy and service delivery changes to meet reauthorization requirements and students’ needs. Student parents need assistance navigating complex schedules. Through counseling support provided by educational programs, employed low-income student parents may be better able to design workable schedules that can meet their needs. Through child care referral and counseling support provided by community agencies, employed low-income student parents and the workforce and education agencies supporting them could benefit. Partnerships between workforce agencies or educational institutions and child care referral agencies, delivering services on or off campus, may strengthen these supports (Adams and Heller 2015). Student parents need access to financial supports, including child care. Attending school and raising children is expensive. To afford these costs, low-income student parents need financial supports, including financial assistance with child care, to help them persist in school and maintain economic stability for their families. Navigators or case managers can help students determine eligibility for and access to social service supports, educational aid, and child care. Scheduling innovations in educational programs could help simplify scheduling complexities for parents. To address scheduling challenges for low-income working parents who attend school, educational programs could implement scheduling innovations that better meet student parent needs. For example, block scheduling (which limits time traveling to and from campus), online programming, and programming at diverse locations and times help low-income student parents access programs, align work and school, and find child care to fit their schedules. Child care policies need to be designed to support parents in education and training. Policies that restrict use of vouchers while parents are in education and training may prevent some low-income parents from accessing education and training. The reauthorization of the Child Care Development Fund in 2014 may create an opportunity to reexamine these state policies to further career advancement for low-income parents, although limited resources will likely continue to be a barrier (Adams and Heller 2015). More child care is needed during nontraditional hours and for young children. Policymakers and advocates can work together to expand the availability of care to meet this population’s needs. Development of child care during nontraditional hours can be difficult because the fixed costs of child care programs and child care regulations require that a certain number of children in the same age group and location need care at the same time, but frequently the demand is low and does not meet these constraints (Thompson 2000; Yen Liu 2013). Educational institutions and workforce training programs using cohort or block scheduling may better group students’ child care needs to support development of off-hours care. Low-income working parents who are pursuing education are an important population for policymakers, funders, and practitioners to consider when funding and designing programs. Students who are able to access and complete education programs, especially programs yielding a degree or certificate, will have greater opportunities to adequately support themselves and their children. Before 1990, educational attainment was measured by years of school completed. Those in college nondegree programs include people attending college classes but not pursuing a degree; this does not include nondegree certifications. The SIPP only asks the designated parent of children from birth to age five about child care arrangements. Adams, Gina, and Caroline Heller. 2015. “The Child Care Development Fund and Workforce Development for Low-Income Parents: Opportunities and Challenges with Re-authorization.” Washington, DC: Urban Institute. Adams, Gina, Shayne Spaulding, and Caroline Heller. 2015. “Bridging the Gap: Exploring the Intersection of Workforce Development and Child Care.” Washington, DC: Urban Institute. Adams, Gina, Caroline Heller, Shayne Spaulding, and Teresa Derrick-Mills. 2014. “Child Care Assistance for Parents in Education and Training.” Washington, DC: Urban Institute. ASPE (Office of the Assistant Secretary for Planning and Evaluation). 2012. “Estimates of Child Care Eligibility and Receipt for Fiscal Year 2009.” Washington, DC: US Department of Health and Human Services, Office of Human Services Policy. BLS (Bureau of Labor Statistics). 2015. “Earnings and Unemployment Rates by Educational Attainment.” Washington, DC: US Department of Labor. Chaudry, Ajay, Juan Pedroza, Heather Sandstrom, Anna Danziger, Michel Grosz, Molly Scott, and Sarah Ting. 2011. “Child Care Choices of Low-Income Working Families.” Washington, DC: Urban Institute. CLASP (Center for Law and Social Policy). 2011. “Yesterday’s Non-Traditional Student is Today’s Traditional Student.” Washington, DC: Center for Law and Social Policy. Enchautegui, María E., Martha Johnson, and Julia Gelatt. 2015 “Who Minds the Kids When Mom Works a Nonstandard Schedule?” Washington, DC: Urban Institute. Eyster, Lauren, Tom Callan, and Gina Adams. 2014. “Balancing School, Work, and Family: Low-Income Parents’ Participation in Education and Training.” Washington, DC: Urban Institute. Greenberg, Erica, Teresa Derrick-Mills, and Olivia Healy. Forthcoming. “Assessing the Quality of the Child Care Workforce across Center Characteristics: Findings from the National Survey of Early Care and Education.” Washington, DC: Urban Institute. Goldrick-Rab, Sara, and Kia Sorensen. 2010. “Unmarried Parents in College.” The Future of Children 20 (2): 179–203. Johnson, Jean, and Jon Rochkind, with Amber N. Ott and Samantha DuPont. 2009. “With Their Whole Lives Ahead of Them.” New York: The Public Agenda. NCES (National Center for Education Statistics). 2013. “Projections of Education Statistics to 2021.” Washington, DC: US Department of Education. ———. 2015. “Institutional Retention and Graduation Rates for Undergraduate Students.” Washington, DC: US Department of Education. Spaulding, Shayne. 2015. “The Workforce Innovation and Opportunity Act and Child Care for Low-Income Parents: Opportunities and Challenges under the New Law.” Washington, DC: Urban Institute. Spaulding Shayne, Robert I. Lerman, Harry Holzer, and Lauren Eyster. 2015. “Expanding Economic Opportunity for Young Men and Boys of Color through Employment and Training.” Washington, DC: Urban Institute. Thompson, Elizabeth Bonbright. 2000. “Non-standard Work Hour Child Care Project.” Tacoma: Washington State Child Care Resource & Referral Network. US Census Bureau. 2000. “Education.” In Census Atlas of the United States, 158–75. Washington, DC: US Census Bureau. Yen Liu, Yvonne. 2013. “The Third Shift: Child Care Needs and Access for Working Mothers in Restaurants.” New York: Restaurant Opportunities Centers United. Shayne Spaulding is a senior research associate in the Income and Benefits Policy Center at the Urban Institute, where her work focuses on the evaluation of workforce development and postsecondary education programs. She is also a board member of the Workforce Professionals Training Institute, an organization that works to build the capacity of workforce development organizations and programs in New York City and nationally. She holds a BA degree from Wesleyan University in American government and a MPP from Johns Hopkins University. Teresa Derrick-Mills is a senior research associate in the Labor, Human Services and Population Center and the Center on Nonprofits and Philanthropy. Her research focuses on performance measurement and performance management, the intersection of nonprofit organizations and government, child care and Head Start policies and provision, workforce development, and citizen engagement. She is also an adjunct professor in the Trachtenberg School of Public Policy and Public Administration at George Washington University. She earned her PhD in public policy and public administration with a specialization in program evaluation. Thomas Callan is a former research associate in the Income and Benefits Policy Center at the Urban Institute, where his research focused on issues related to the safety net and workforce development programs. This brief was funded by the Annie E. Casey Foundation through the Urban Institute’s Low-Income Working Families Project, a multiyear effort that focuses on the private- and public-sector contexts for families’ well-being. We are grateful to them and to all our funders, who make it possible for Urban to advance its mission. We are also thankful to Marcus Gaddy and Amanda Briggs for their assistance in finalizing the brief, and to Margaret Simms, Gina Adams, and Kelly Mikelson for their helpful feedback.